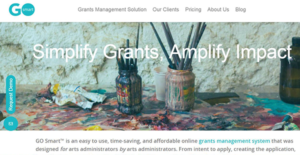 Go Smart is a time-saving, cloud-based grants management system designed by art administrators and nonprofit gurus to simplify grants and amplify their impact. It is an easy-to-use application that enables nonprofit organizations, grantmakers, and art administrators to manage panel adjudication, grants applications, data reports, interim & final reporting, and more. The platform is renowned for its quick implementation and a modern responsive design that significantly abridges grant management. Go Smart is powered by Western States Arts Federation (WESTAF); a regional nonprofit art service organization intended to strengthen the organizational, financial, and policy infrastructure of arts. As a result, the application is designed specifically for arts and cultural administrators. Some of its core features include simplified user roles, stellar customer services, template forms, ready-to-use statuses, send emails by status, and comprehensive reports. Go Smart is a simple solution with quick implementation and flat learning curve. The solution provides quick and thorough training that is delivered by product experts to help users build grants in a snap. Its simplicity is also aided by the stellar customer service and easy-to-use functionalities which include streamlined profile, simplified user roles, ready-to-use statuses, template forms and more. In addition, Go Smart provides automated statuses that help you move grant applicant through your workflow without a hassle. Besides, the application offers reliable features that simplify the setup and management of panels in the system. It allows you to create multiple panels per application opportunity, add custom criteria with designated score ranges, and assign panelist to panels (single or multiple). In addition, Go Smart makes it easy to meet all your data retention needs. It enables you to easily download reports and automatically generate PDF of all your applications. Lastly, Go Smart is a time saver. This streamlined grants management system saves you administration time. The platform provides numerous time-saving features that enable you to quickly build an intent to apply, create an application, interim/final reports with one of the nine template. Better still, there are 11 unique question types to choose from when customizing your grant to collect the data you need to make smart funding decisions. If you are considering GO Smart it could also be beneficial to investigate other subcategories of Best Grant Management Software listed in our database of SaaS software reviews. Since each organization has particular business needs, it is sensible for them to refrain from searching for a one-size-fits-all ideal software solution. Needless to say, it would be futile to try to find such an app even among market-leading software platforms. The smart thing to do would be to catalog the various important factors that need consideration such as key features, finances, skill levels of staff members, company size etc. Then, you should do your groundwork thoroughly. Read some GO Smart reviews and investigate each of the other apps in your shortlist in detail. Such comprehensive research can make certain you discard ill-fitting applications and zero in on the solution that offers all the features you require for business success. How Much Does GO Smart Cost? GO Smart offers a simple enterprise pricing structure with prices starting at $2500. Contact the vendor for detailed pricing information. We realize that when you make a decision to buy Grant Management Software it’s important not only to see how experts evaluate it in their reviews, but also to find out if the real people and companies that buy it are actually satisfied with the product. That’s why we’ve created our behavior-based Customer Satisfaction Algorithm™ that gathers customer reviews, comments and GO Smart reviews across a wide range of social media sites. The data is then presented in an easy to digest form showing how many people had positive and negative experience with GO Smart. With that information at hand you should be equipped to make an informed buying decision that you won’t regret. What are GO Smart pricing details? What integrations are available for GO Smart? If you need more information about GO Smart or you simply have a question let us know what you need and we’ll forward your request directly to the vendor.